Mobile Code is an emerging paradigm that is gaining momentum in several fields of application. Network Management is a potential area for the use of this technology, provided it will be able to interoperate with well established solutions for Network Management. 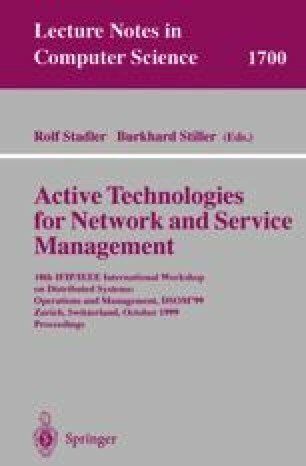 This paper presents the integration a classic NM protocol, like SNMP, into a platform of Mobile Agents. Our platform, called JAMES, has been developed in the context of an Eureka Project (Σ!1921) where the project partners are University of Coimbra, Siemens SA and Siemens AG. Since the main target of the platform is network management, it includes a set of SNMP services allowing mobile agents to easily interface with SNMP agents, as well as with legacy SNMP-based management applications. In the paper we present a brief overview of the general architecture of the platform and we describe in some detail the framework we used to provide for integration between mobile agent applications and SNMP.